Last weekend my globe-trotting uncle Jeff swung by Seoul for a speedy visit. We were super psyched to get the opportunity to show him around, and tried to pack as many sights and gastronomical delights into the weekend as possible! UPDATE: 23/07/16. The Jetoy Flagship Store in Apgujeong has apparently MOVED: its new location is 14 Noon Square, 3rd Floor, Myeongdong. Click here for a map. Anyhoo! My absolute favorite cute Korean stationery brand here is Jetoy Choo Choo, which most notably features glorious googly eyed cats surrounded by pastel pink roses and sparkly butterflies…sigh! Insadong is rife with traditional Korean vegan and vegetarian restaurants serving temple food; we’d already visited the two most well-known temple food restaurants in this area, Sanchon and Baru, so over Buddha’s Birthday weekend, we visited two lesser known establishments: Oh Se Gae Hyang and Han Gwa Chae. Most restaurants in Insadong are located down a series of winding labyrinths with random dead-ends, hidden doors, and unmarked fronts. Even while using the most sophisticated navigation equipment, you’re bound to get a bit lost wandering around here! Last year, we spent Buddha’s Birthday at Haedong Yonggungsa, a seaside temple in Busan. (Click here to check out the post!) It was an unforgettable experience, with the smell of incense combining with the scents of sea, and the sight of the brightly-colored lanterns hanging against the rocky coastline. This year, we spent Buddha’s Birthday in the midst of the bustling city, at Jogyesa Temple in Insadong. This past weekend was one of Korea’s biggest (and by far the brightest) holidays: Buddha’s Birthday, also known as the Lotus Lantern Festival. Eating out in Seoul is a true delight, and a real treat for us since we’ve given up completely on eating out in Ulsan, the land of endless greasy Korean barbeque and fried chicken joints. Our diets have changed completely since moving to Korea, due to a combination of factors, including price and availability of certain foods, and my outlook on the food industry has changed a lot since moving here. Korea is a country OBSESSED with meat. You can’t walk down a street without coming across posters depicting piles of raw beef and fatty strips of pork. And, as you’d expect in a country where the consumption of dog and whale meat is still very prevalent, there really isn’t much in the way of animal welfare, or the humane treatment of animals. Consequently, I’ve pretty much stopped eating meat and animal products entirely since moving here. The only animal products I still consume are organic honey and sustainably wild-caught sardines, which I have shipped over from the US. Thankfully, we were spoiled for choice with delicious vegan options in Seoul! Righty-o! So, part two of our Seoul adventure took us to Insadong; this is the place to go if you want to buy Korean antiques and traditional crafts. It’s a pretty tricky area to navigate, loads of tiny little streets and alleyways absolutely brimming with shops and restaurants. Our main purpose for visiting Insadong was to find a reportedly amazing Buddhist temple food restaurant called Sanchon. It took us a good while to find it after unsuccessfully following two different sets of directions I’d gotten off the internet. The best way to find this place is to type the address into your phone and wander around staring at your Google map, trying not to bump into anyone in the process. Sanchon is tucked away in one of Insadong’s many alleyways, but the hustle and bustle of the city completely vanishes as soon as you walk in the door. 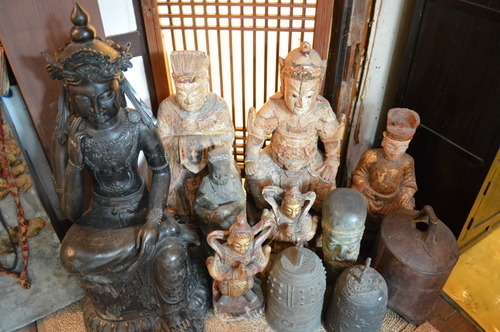 It’s beautiful inside, with loads of Buddhist antiques, art, and hand-crafted souvenirs.